Biking is a good way the explore a place and its natural beauty. You will ride off beaten trails on natural terrain. This 3 days biking tour will take you in the open steppes, land of nomadic family with grazing horses, sheep and cattle. You will cross the small rivers, green hills and grassland in the beautiful countryside. The last day will be spent in Hustai National Park where we will observe camping on river side and visiting at nomadic family gives you more taste of Mongolian lifestyle and adventures. We ride to visit at national park and see the Mongolian wild horses on bike. You may feel that you are from nature on this trip. We ride about 50-60km per day and each day we are supported by vehicle and cook. This trip brings you to adventures and riding experiences. Day 1. Biking to AltanBulag Valley. Day 2. Biking to a Nomadic Family Near the Tuul River. Day 3. Biking in the Hustai National Park & Wild Horses. 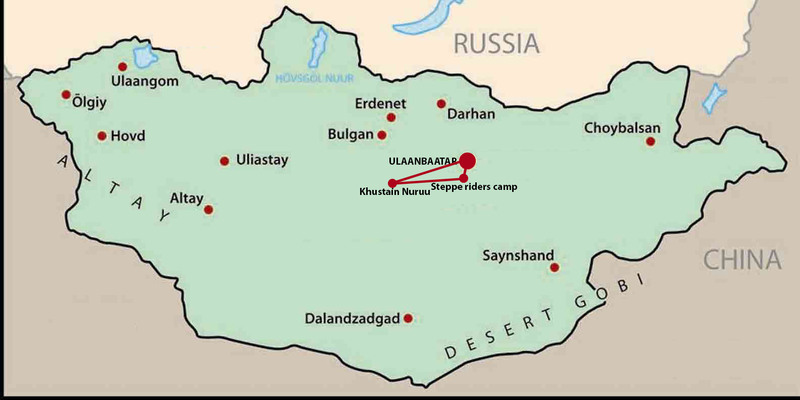 Meet us at Stepperiders’ camp where we will start our bike trek towards Altanbulag valley in the open steppe. You will enjoy riding through natural beauties such as green rolling hills, vast steppes, thousands of livestock and nomadic families. On the way, we will stop for short break at the AltanBulag local village then we will keep biking to the Tuul river where we will camp. Stay overnight in tents, next to the Tuul River. Day 2. Biking to Nomadic Family Near by Tuul River. In the morning, we will continue our adventure riding along side of Tuul river. Enjoy watching birds, livestock and landscape. In the afternoon, we will visit at nomadic family to share a cup of milk tea and learn from their life experience. We will continue biking towards our camping places. Stay overnight in tents, at the river shore. Day 3. Biking To Hustai National Park & Wild Horses. Today is our last day biking and we will spend it in the Hustai National Park. We will observe Mongolian wild horses Takhi and more wildlife. At the end of the day, we will drive back to Ulaanbaatar or Stepperiders’ camp.